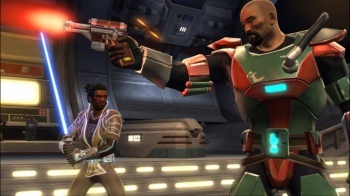 BioWare Austin can't guarantee that Old Republic's hybrid model will earn more money. Last year, Star Wars: The Old Republic was in a prime position to knock World of Warcraft down a peg or two. We know now that this wouldn't be the case, but even in hindsight it's hard to find people who expected the game would fail so quickly. Now with subscription numbers plummeting, BioWare has been hard at work adapting the game to a free-to-play system in the hopes that it changes the title's prospects, as was the case for other faltering MMOs. But BioWare's Matt Bromberg is taking a more cautious approach, noting that while he certainly hopes more people come to The Old Republic through the free-to-play model, that doesn't necessarily guarantee success. "I don't know," Bromberg answered when asked by CVG whether he thought The Old Republic could make more money using free-to-play. "Obviously we are a business and we have to grow that business, but my primary intention is to make as many people play this beautiful game that we've made. It just so happens that the business will naturally grow as more people come to play the game, but we're not trying to squeeze every single penny out of it." Considering the hype Old Republic generated that failed to materialize six months later, Bromberg's comments are understandably pragmatic and cautious. Despite it all, the BioWare Austin executive isn't entirely convinced that the failures of subscription-based games like The Old Republic means free-to-play markets are now the answer. "A lot of other games that have moved from subscription to hybrid haven't lost as many customers as you might think, in fact a lot of them have gained subscribers," he noted. "I think it's different for every game. In general it appears that most MMOs are moving in the free-to-play direction, but I still think there's an opportunity still for some more specialist MMOs." Some of Bromberg's hesitation to break fully from subscription models is understandable. BioWare spent years crafting what they thought would be a hugely successful subscription-based game, and are now being forced to rethink its entire monetization model half a year after release. Still, even World of Warcraft, the most successful subscription-based game on the market, has adopted a partial free-to-play model to attract new players. If WoW needs to change the way it operates in today's industry, even slightly, it's hard to imagine that any newcomer could operate fully on a paid model.